We can also supply clear film and opaque white PET laminates that can be used for lidding for gamma and electron beam sterilization of medical products. These packaging materials are radiation compatible. 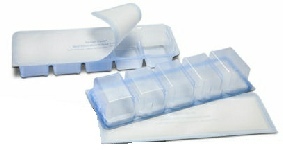 PET/PETG Adhesive / Tyvek® is a medical grade packaging coated Tyvek® heat sealable lidding material. Tyvek® provides a tough tear resistant, breathable, lidding stock with sterile barrier properties. A non-toxic water based hot melt heat sealable adhesive system, which is designed to heat seal to PET/PETG trays, is applied in a design coat pattern so that there is only adhesive in the seal areas of the lid. This means that the breathability of the Tyvek® is not affected by an adhesive coating. This could mean more affective sterilization and no adhesive will come into contact with the medical device in the package. The adhesive provides a strong but peelable seal, which transfers to the seal area of the PET/PETG tray. The lidding material is radiation and ETO sterilizable. The lidding material is unaffected by moisture. To receive pricing information, you can inquire by email or phone. Please let us know: the size of the die cut lid, what grade of Tyvek, or weight of medical grade paper. Also how many thermoform tray lids are required. If you would like printing we would need details of your requirements. We can print up to 8 colors. Thermoform Tray Lidding, Die Cut Lids medical grade paper, foil laminations, polyethylene or Tyvek 1073B, Tyvek 1059B, Tyvek 2FS. Fully coated lidding, or zone coated lidding with proprietary Design Coat™ zone coating. Nine color flexographic/die cutting machine used for Design Coat™ production. 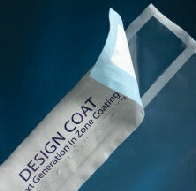 Develop and validate sealing parameters for Design Coat® lids sealed to rigid trays. Graphic design and printing plate manufacturing, CAD drawings for exacting specifications.